This year I think I have done a pretty good job of keeping the stash well under control, particularly with the number of sweaters completed and underway. I have also done a fair bit of test knitting for Woolgirl. Of course, what that means is that there has been some stash enhancement in recent weeks. Marguerite (the three pictures above) is a wonderful combination of several different colors. Can you believe all those shades in one skein? Pressed Flowers is the other colorway. This is so my favorite. I cannot wait to see how the colors knit up. The color is quite a leap for me, I know. It is not quite as yellowish as the picture and is a bit softer and paler green. Much like a Granny Smith apple. I just adore it! 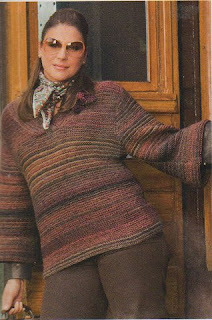 However, brace yourself because I just availed myself of the current sale going on at Woolgirl. 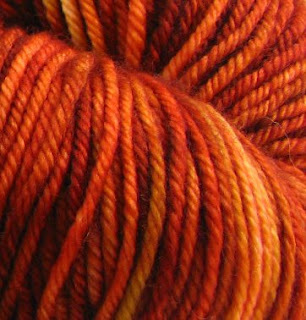 I have been keeping an eye on some Madeline Tosh worsted in a colorway called Saffron. I think I have definitely fallen completely off the cliff. Red is a color I love, but never wear, even though it looks great on me, because I do not like to draw attention to myself. My personality does more than enough of that for me without siren colors. But, this deep reddish orange has really been calling my name. It started with the Malabrigo in Sealing Wax. Remember? So, anyone else have a few stash confessions to make? I did a huge amount of damage at Tess' in Portland, but the dumb box still isn't here. And I probably not confess nearly all of it! You picked some great stuff!!! OMG! I love it all. I so love it all! The draft mitts are done in the tweed and I learned many a lesson. They aren't pretty but they ARE warm. And it lets me know that stashing was for a very good purpose!